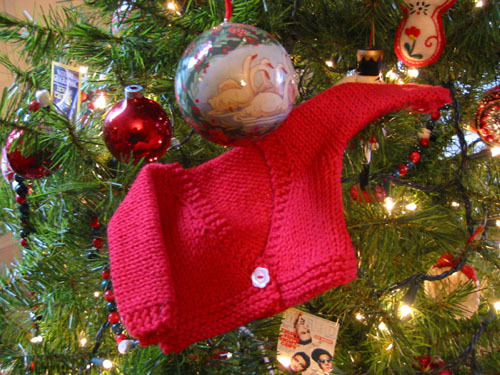 Looks like I joined this year's the mini-sweater ornament craze, right? Well, not exactly. Just before Christmas, Jason's sister was heading into the last month of her pregnancy. When her blood pressure started creeping up, they decided to play it safe and have this baby sooner rather than later. Baby was very nearly full term, and looked to weigh around five pounds during the last scan. Imagine everybody's surprise then when baby Sydney arrived, a few days before Christmas, at a whopping three pounds, 13 ounces. Jason spent Syd's Birth Day patiently explaining to everybody in his family the three things that preemies tended to struggle with: breathing, eating and regulating their temperature. Sydney pulled off all three with aplomb from the beginning; except for her petite stature she seemed for all the world to be a healthy, full-term newborn. A healthy, full-term newborn with no clothes that fit her, that is. News trickled up from New York: preemie clothes were too big, Jason's mom was quickly sewing up buntings as fast as she could. All I knew was that this child needed a sweater, and quick. Auntie Gringa to the rescue! I did some research on the chest and length measurements of preemies and some back-of-the-envelope calculations to convert the Bulky Baby Bibby pattern into a Worsted Preemie Bibby pattern. Not counting a few ripping interludes, I'd guess that the whole thing took 90 minutes and less than a ball of Classic Elite Spotlight. 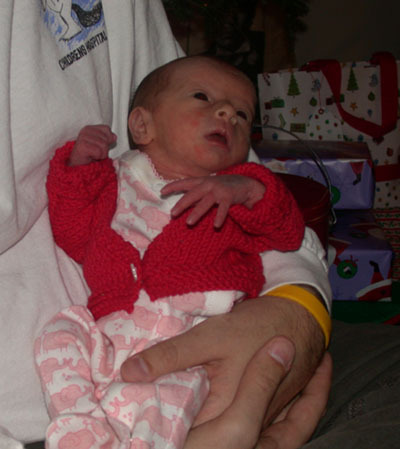 (The bib didn't "down-size" well, so I eventually scrapped it, and made it a Worsted Preemie Cardie.) The final result was impossibly small. I kept measuring it and comparing it to the preemie stats I had found because I just couldn't believe that it would fit a human being. On Christmas Eve morning, we raced down to New York, eager to meet the newest family member. Jason sister called: the doctors had given Sydney the green light to go home. The siblings conspired; we were to head directly to Jason's parents house where his sister would meet us with the baby. The parents were not to know. By the time they arrived the whole family had congregated for festivities, and there was -- as you can imagine -- much rejoicing. A few hours later, when Jason was showing his sister the art of swaddling (I know! Swaddling a baby! On CHRISTMAS EVE! Oh, the symbolism! ), he grabbed the sweater and slipped in on her. Jason's family did a modified Secret Santa this year -- each couple picked two individuals in the family for whom they bought presents. We picked John (brother-in-law) -- you've seen my knitting contribution to his presents -- and Lauren, Jason's sister-in-law. (You may also remember Lauren as the recipient of the Honeymoon Cami.) The choice for Lauren was an easy one; I had heard raves about Debbie Bliss Cashmerino Superchunky, and once I laid eyes -- and hands, my goodness is this stuff soft -- on Alison's orange bliss scarf I was sold. John, Jason's brother-in-law, is a huge Redskins fan. So when we picked him in their family's Secret Santa, I knew we had at least one "no brainer" gift. 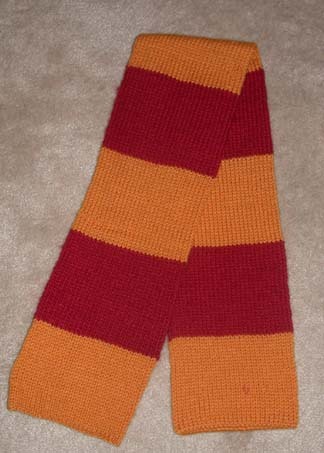 This scarf was based loosely on Hogwarts scarf, and I used Lamb's Pride (Worsted) and Nature Spun -- both by Brown Sheep. 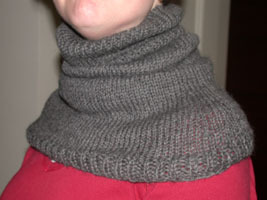 It wasn't as long as I had hoped, but since it's knit in a tube it's easily the warmest scarf I've ever made. --Status: Finished 12/9, just have to weave in ends during the car ride to NYC tonight. We do a Yankee Swap at our office holiday party. (Who came up with this game? It's barbaric!) And since the "official" rules linked above weren't cruel enough, our rules stipulate that if somebody steals your gift, you can chose a new one from the unopened pile or from anybody who's gone before you. Did I mention that in our office, almost everybody brings -- and expects to leave with -- hard alcohol? A greed for alcohol that inspires stealing from your coworkers: how festive! This scarf is made from merino wool, known for being warm and lightweight. Avoid machine washing/drying unless you want it to become a fuzzy, miniature version of its former self. Wash with mild detergent (hand soap is fine! ), squeeze water out and lay flat to dry. Enjoy! While wrapping the scarf, I indulged in some self-congratulation for bucking the trend. By the time I got to the party, though, I was feeling a little panicky. What if nobody wants it? What if the person who gets it feels compelled to be gracious when all they really wanted was the Bailey's? 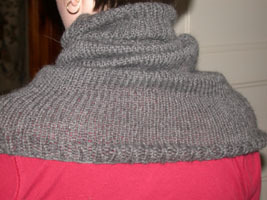 And finally, Why, oh why, did I bring something I knit? Giving a gift that may be poorly-received is one thing, giving a hand-knit that may be poorly-received is, well... masochistic! The game dragged on and my little gift bag remained on the table due largely, I think, to the fact that it was distinctly non-alcohol-shaped. Then Sarah approached the table. Sarah and I are buddies -- we've suffered through some awful projects together, which is a guaranteed bonding experience. We're currently suffering through the wedding planning process together as well, which I can report is also a bonding experience. Most important, she and I have discussed the pathology of the booze-fueled Yankee Swap. I got lucky. She plucked my non-alcohol-shaped present off the pile and came back to our table. She seemed genuinely pleased with the scarf. Best of all, since she knows I'm a knitter and was prepared (I suspect) to be getting something I knit, there was no need for me to awkwardly blurt out, "I made it!" 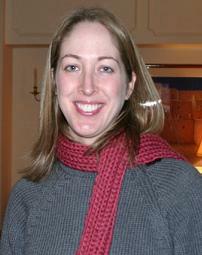 And with that, I happily cross "Yankee Swap scarf" off my holiday knitting list. Next!